It is with tremendous sadness that AVST received the shock news of the sudden passing of Ugo Ehiogu. This of course during a season where we have already had to endure the bitter loss of Graham Taylor and Dalian Atkinson. With Ugo you always knew what you were going to get. He was a huge man, both in character and physical stature. Someone who always gave 100%. 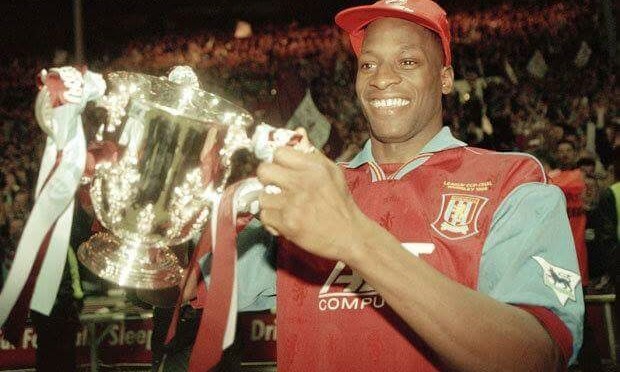 He had an illustrious career with Villa, playing over 250 games for the club, and was part of the last Villa side to win silverware in the 1996 League Cup. More than this though, Ugo was a nice man. In this modern football world, where the distance between supporters and players has never been greater, it has been clear from our members that Ugo was different. Someone who had time for a chat about football in a bar. Who didn’t refuse autographs. Who was unassuming and not wrapped up in the trappings of the money that comes with being a footballer. Ugo the player was a colossal competitor and had a fantastic career. He worked hard to improve his game and was generous with his time for younger players coming through the ranks. We certainly count ourselves as blessed to have seen a back three where he played alongside Paul McGrath and Gareth Southgate in one of the most exciting Villa teams of the last generation. So it is painful to say goodbye. 44 is no age to lose a warm and generous man. Our thoughts go out to his family, friends and former teammates at this sad time. Let us hope everyone at the game this Sunday observes the minute’s applause. It is the very least he deserves. Previous PostAVST MEMBERS REACTION TO Q&ANext PostWhen the AVST met Xia!